Cushman Motor Company sells Ventrac, Holder and Steiner compact tractors with different types of finish mower attachments. We sell new and used tractor mower attachments, OEM parts, factory trained service, and we also rent tractor mower attachments. 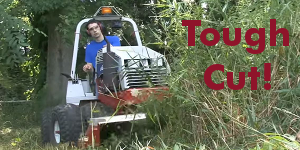 Our commercial tractor mowers are rugged high performance machines designed for the land care and parks professional who must handle every type of turf care challenge. Ventrac, Holder and Steiner are true all-season compact tractors that do it all. Why limit your investment to a dedicated when you can use these tractors to mow, aerate, sweep, lift rock, remove snow and much more. Watch this video to learn why Ventrac’s finish mower decks are better than ever. The Ventrac finish mower attachment has four cutting width/discharge options: 60 inch side discharge, 72 inch side discharge, 72 inch offset, and 72 inch rear discharge. Standard features include heavy gauge steel deck construction and reinforced frame; single-lever precision mowing height adjustment (1 to 5 inches in 1/4″ increments); and a flip-up deck for easy maintenance. Click the images below for more specification info. Why does a Center Articulating and Oscillating Frame matter when mowing? The compact tractors Cushman Motor Company sells have a center articulating and oscillating frame. Why does this matter? Because you can quickly navigate around obstacles with ease. Unlike a zero turn mower, skid-steer, or straight frame tractor – the rear wheels of an articulated tractor follow in the same path of the front wheels. This means the front or rear attachments follow the same path as the tractor, minimizing the space required to turn and reducing the likelihood of hitting an obstacle.